Hunters, settlers and soldiers boosted their reach and firepower with metallic cartridges and Sharps rifles. Even today, the renowned rifle is popular looking to connect with distant targets. Make Money with the Gun Digest Affiliate Program! It doesn’t matter if you’re a new blogger with a passion for firearms, a content curator with a million Twitter followers, a large company looking to diversify your product lineup or just someone interested in making a little money on the side, the Gun Digest Affiliate Program is a great fit. Loading from the breech had been a dream long before the advent of the percussion cap. As legions of mechanics struggled with repeating actions, Christian Sharps built a stronger breechloading single-shot. The New Jersey native had apprenticed under John Hall at Harpers Ferry Arsenal. In 1848, he received his first patent, for a sliding breech block. The tight breeching held promise for hunters, because it could handle cartridges that would hit hard at long range. Sharps rifles played a signal role in the act of clearing the plains of large animals. It was a period of shameless killing and insatiable appetites. The U.S. Army turned a blind eye to the slaughter, as it advanced its own aim to bring recalcitrant Plains Indians to heel. Starving tribes capitulated. In 1872 I organized my own outfit and went south from Fort Dodge to shoot buffaloes for their hides. I furnished the team and wagon and did the killing. [My partners] furnished the supplies and the skinning, stretching and cooking. They got half the hides…I had two big .50 Sharps rifles… . The time I made my biggest kill I lay on a slight ridge behind a tuft of weeds l00 yards from a bunch of 1,000 buffaloes… After I had killed about 25 my gun barrel became hot and began to expand. A bullet from an overheated gun does not go straight, it wobbles, so I put that gun aside and took the other. By the time that became hot the other had cooled, but then the powder smoke in front of me was so thick I could not see through it; there was not a breath of wind to carry it away, and I had to crawl backward, dragging my two guns, and work around to another position on the ridge, from which I killed 54 more. In 1½ hours I had fired 91 shots, as a count of the empty shells showed afterwards, and had killed 79 buffaloes, and we figured that they all lay within an area of about 2 acres of ground. My right hand and arm were so sore from working the gun that I was not sorry to see the remaining buffaloes start off on a brisk run … . The last half of the 19th century was the most productive period in firearms history, albeit progress came in fits and starts. Christian Sharps fielded several forgettable rifles before his company came up with its powerful, long-range “buffalo rifles.” The first patent model Sharps was an 1841 Mississippi rifle with a new breech that featured a vertical sliding block operated by a guard-bow finger lever. Six rifles have been produced under the Sharps name: Models 1849, 1850, 185l, 1852, 1853 and 1855. The last four were “slant-breech” rifles, the breechblock operating at a 112-degree angle to the bore. Some military versions had a “coffee mill” in the buttstock (most soldiers of the day used it to grind grain). During the late 1850s, Sharps rifles were shipped by abolitionists to Kansas “Free Staters,” to get votes against slavery. A shipment of 200 carbines got to John Brown. In the West, the Sharps rifle became known as “Beecher’s Bible,” after a news item described abolitionist Henry Ward Beecher’s observation that, “You might as well read the Bible to buffaloes as to those fellows who follow Atchison and Stringfellow; but they have a supreme respect for the logic [of] Sharps rifles.” When the Civil War broke, the Sharps enterprise was producing 30,000 guns annually in a factory driven by a 250-horsepower, single-cylinder Corliss steam engine. The Sharps Rifle was potent when used on the American Bison. Unfortunately, it was almost too potent for its own good. The Model 1859 was followed by new models 1859, 1863 and 1865. The strength, accuracy and potent chamberings of Sharps rifles would endear them to hunters. The Civil War put them into the hands of Colonel Hiram Berdan’s Sharpshooters. Initially, these troops were equipped with muzzleloaders, and Berdan’s request for breechloaders brought only surplus Colt’s revolving rifles. These he refused, and his men threatened mutiny! They finally got Sharps, though these lacked the double set triggers Berdan had ordered. At Gettysburg, 100 sharpshooters and 200 Maine regulars held Little Round Top against 30,000 Confederates. They fired nearly 10,000 rounds in 20 minutes! As government contracts dried up after the war, the Sharps Rifle Manufacturing Company shifted its focus to sportsmen. The New Model 1869 was the first cartridge Sharps with no provision for outside priming. It came in .40-50, .40-70, .44-77, .45-70 and .50-70. Only 650 were produced before the Model 1874, announced in 1870, replaced it. The 1874 in myriad forms would remain popular for 12 years. Christian Sharps died of tuberculosis, in 1874, but the Sharps Rifle Manufacturing Company, built on patents Sharps had bargained away to Penfield, chugged along. The Model 1875 Sharps rifle incorporated patents by Rollin White and Nelson King. A Long-Range version shown at the Philadelphia Exposition was bought there for $300 by Colonel John Bodine. It remains the only surviving specimen, as no other 1875s were made. But Charles Overbaugh and A.O. Zischang, who had helped design the rifle, delivered a replacement. The Model 1877 had a leaner, rounder action. Locks and barrel blanks came from Webley of England. Like the Model 1874 Creedmoor that would hand Americans their victory over the Irish in the first Creedmoor match, it excelled at distance. Fewer than 300 Model 1877s were built, in three grades priced at $75, $100 and $125. Overbaugh made 73 into scheutzen rifles. Denver dealer J.P. Lower sold 75 as “special Model 1874s.” These became known as “Lower Sharps” rifles. Hugo Borchardt joined Sharps soon after the Model 1875’s debut. Like Nelson King of Winchester fame, who became plant superintendent at Sharps, Hugo Borchardt turned his hand to rifle design at the firm. He earned $1,855 for his first rifle, the Sharps Model 1878. The first 300 Borchardt rifles went to the Chinese government in 1877. Its action also showed up in hunting and target guns priced as low as $18. In May 1879, Hugo Borchardt sailed to Europe seeking military contracts. He got none. Sharps’ efforts to field a repeating rifle came to naught, and the company scrambled. Retailers were given huge markdowns on re-barreled Sharps rifles. Carlos Grove & Son, of Denver, took 270 Model 1874s at $15 to $17 each! It was the beginning of the end. The Sharps Rifle Manufacturing Company vanished from Connecticut records in 1905. The Sharps rifle most celebrated is the 1874, which, if you’d bought one with double set triggers in 1878, would have cost $44. Replicas can bring a hundred times as much now. The movie Quigley Down Under introduced the Sharps to people who’d never heard the name. Following the film, in which its star, Tom Selleck, drills a bucket far away, the Quigley Match emerged in Forsyth, Montana. A bucket-shaped target, 44 inches wide at the top is 1,000 yards off—a long shot for a scoped bolt rifle. For a blackpowder Sharps, iron sights and round-nose bullets at 1,400 fps, it is indeed a challenge! Still, many shooters hit that bucket regularly! Despite the Sharps Rifle being a more than 150-year-old design, modern manufacturers continue to product the timeless firearm. Above is a specimen from Shiloh Sharps out of Montana. Surely the best known—and most debated—of Sharps feats occurred at the frontier town of Adobe Walls in the north Texas panhandle. Buffalo hunter Billy Dixon was one of just 28 men sleeping in the tiny settlement on June 26, 1874. At dawn, 700 Comanche warriors led by chief Quanah Parker, killed three whites before the remaining defenders barricaded themselves in buildings. Most were hunters, well armed. They repulsed the charge with withering rifle fire, but they were badly outnumbered, and many of the Comanches had repeating rifles. Two days later, some warriors still lurked, like circling wolves, on the perimeter of Adobe Walls. As legend has it, about 15 appeared on a bluff nearly a mile off. Billy Dixon, renowned for his marksmanship, was urged to take a shot with the local saloon owner’s .50-bore 1874 Sharps. Dixon had used this rifle during the initial attack, so, when he took aim, there was more than hope at play. Still, onlookers were astonished, when, seconds after the blast, one of the Indians fell off his horse. The distance was later surveyed at 1,538 yards. Possible? Yes. Probable? Certainly not. Wind drift aside, that bullet would have been descending so sharply that a range estimation error of just 50 yards would have caused a miss. Whether or not you believe Billy Dixon hit a Comanche at more than 1,500 yards with a blackpowder Sharps, you’ll have plenty of company! The Sharps 1874 has come to rival the Winchester 1873 as a signature rifle of the post-Civil War West. Shiloh Sharps, a Montana company that now builds Sharps rifles after their original design, put an 1877 Sharps on its list, in 2013. Given the high quality and attention to detail lavished on the company’s 1874s, from Old Faithful hunting rifles to Creedmoor target versions—and the strong demand for them—the 1877 likely will build a list of backorders. 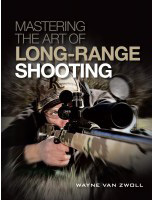 Mastering the Art of Long Range Shooting by Wayne van Zwoll is a complete guide for long distance shooting, and is perfect for the rifle enthusiast interested in hunting and competitive shooting. Dive into the history of snipers from the Civil War era to present, then explore how to choose the correct hardware for varying conditions. With this book you can tackle the shots you always wanted to with confidence and ease, and improve your accuracy in no time! I love my 1874 Sharps! That’s a manly man’s gun tho, shooting that standing from the shoulder isn’t for sissies. I find no reference to the sharpshooters at Little Round Top. They were heavily involved at the Peach Orchard and Devil’s Den, both to the West of the Round Tops, and at Pitzer’s Woods, but not at Little Round Top. The end of the Federal line was held by the 20th Maine, with the 83rd Pennsylvania to their West. The 20th Maine, Commanded by Col Joshua Lawrence Chamberlain, repulsed all of the Confederate advances, and broke the back of the Confederates by conducting a bayonet charge as they were about to run out of ammunition.